Hundreds of green sea turtles are swimming free again after a multi-state effort to return the cold-stunned animals to warmer waters. A sharp drop in recent temperatures caused an estimated thousand cold-stunned sea turtles to become stranded along the Outer Banks. After an extensive and ongoing rescue response in North Carolina, several hundreds animals have been cleared for release and transported to Florida by state agencies including the S.C. Department of Natural Resources (DNR). Cooling temperatures along the Atlantic coast typically prompt sea turtles to travel south each winter in search of warmer waters. But following an unusually warm December, the recent arrival of cold weather overtook many young sea turtles still swimming in North Carolina waters, immobilizing the cold-blooded animals in a response similar to hypothermia. 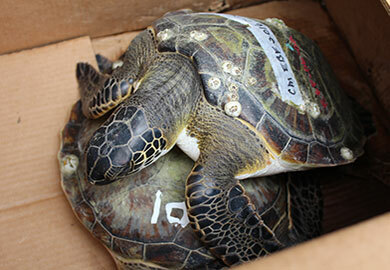 Cold-stunned turtles have difficulty swimming and often end up pushed ashore by ocean currents. Led by the N.C. Wildlife Commission, dozens of aquariums and organizations mobilized to rescue and rehabilitate the animals. Most of the affected animals are juvenile green sea turtles, a federally endangered species, that have responded quickly to treatment, according to the N.C. Wildlife Commission. The S.C. Department of Natural Resources (DNR) assisted today and last Friday by transporting 275 of the rescued sea turtles across the state of South Carolina. Colleagues with the N.C. Wildlife Commission and the Georgia Department of Natural Resources moved the sea turtles the remainder of the way to the Atlantic coast of Florida, where all of the animals were safely released into the surf. "Our hope is that this collaborative effort to quickly get these animals back into warmer waters will have a positive outcome for these turtles," said Michelle Pate, DNR biologist and coordinator for the agency's sea turtle program.